At the age of two, Wong Kar Mun (Lee Sin-Je) went blind. 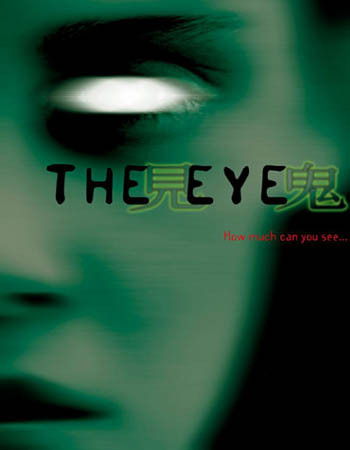 It’s eighteen years later and a new and risky corneal transplant operation restores her vision, but a series of inexplicable events leads her to believe there is more than meets the eye to her newfound gift of sight. Mysterious black-clad figures seem to foreshadow sudden deaths, and horribly disfigured denizens of another side haunt her everyday existence. Unable to define her own identity, she comes to understand that whenever she looks into a mirror she doesn’t see herself but instead sees another woman: Ling, the original owner of the corneas. It seems that Mun has inherited Ling’s fate and the misery that comes with the ability to see more than she wants to. The Pang Brothers were inspired to make THE EYE by a news story from many years ago about a young woman who committed suicide soon after she underwent a corneal transplant. After doing some research, the brothers discovered that the woman had been a positive, energetic and admirable person who had never felt defeated by her blindness. Was it possible, they wondered, that her eye-opening experience killed her in the end? Arisa Feb 28 2014 12:29 pm This movie is unforgettable !!!!!!!!!!! !